Sure, why not. Sometimes interesting things about Mars get posted online. Like this new gravity map of our red neighbor posted by NASA. But how long ago was this the case? One thing to keep in mind is the dichotomy between the martian hemispheres. The southern hemisphere is made up of high plateaus while the northern hemisphere is a huge basin. 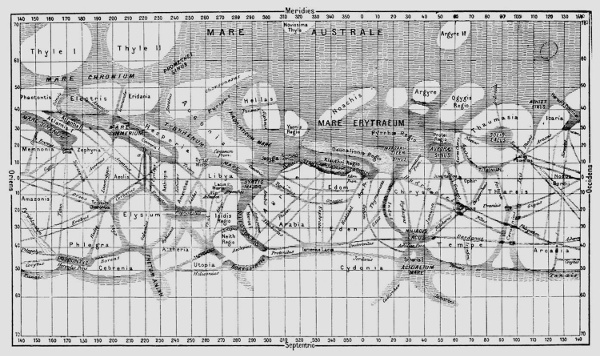 One theory is Mars was struck by a gigantic object in the north, screwed up its areological cycle. The areological cycle being analogous to the geological cycle of Earth with an active core, flowing mantle, and robust magnetic field. This magnetic field protects our planet from cosmic rays, solar storms, and other phenomenon with the potential of whittling away the hydrogen and oxygen in our ubiquitous oceans. In short, no magnetic field: no water. No water: no life. Evidence of martian oxygen is self-evident by Mars's red regolith, made up of iron oxide or rust. More specifically, iron (II) oxide, Fe2O3. Spirit, Opportunity, and Curiosity have already found tons of this stuff we call hematite. It's good evidence for water, but much stronger for an oxygen atmosphere. What's crucial for taking an ancient oxygen atmosphere out of the realm of theoretical possibility to reality is the Curiosity rover's discovery, and analysis of manganese oxide on our red neighbor. To say this is exciting is an understatement! IMHO, we should send a rover to trundle over and poke around. The results of a new experiment published today in Nature Geoscience detail how scientists made the finding and what it means. Researchers built a chamber simulating the conditions and atmosphere of Mars, then put ice in there to melt. The ice did melt and the water from it flowed—but there was also a surprise. The surface of the water boiled as it flowed, and that boiling was strong enough to move not just the water but also dirt and debris surrounding the streams. Importantly, temperature was not the major factor in this boiling water, it was due to the pressure of the atmosphere. A possible explanation for that high-altitude cloud from a few years ago. Who needs spacesuits anyway, eh? For a few weeks in late 2013 and early 2014, Curiosity noticed that atmospheric methane—a gas that could possibly be an indication of microbial activity—surged from an average background level of about 0.7 parts per billion all the way up to 7 parts per billion. (T)he rover's measurements do suggest that much subtler changes in the background methane concentration—amounts much less than during the spike—may follow a seasonal pattern. "For more than a quarter century, failure to identify shoreline features, consistently distributed along a constant elevation, has been regarded as inconsistent with the hypothesis that a vast ocean existed on Mars approximately 3.4 billion years ago," said Alexis Palmero Rodriguez from the Planetary Science Institute in Tuscon, Arizona. Forget water, it shows that Mars had geological (more appropriately areological) activity causing tsunamis. But did the ocean come before the putative great northern impact? Which part of Mars is facing us? Although very similar, each has a few slight differences from the other, so they're complimentary. Note that the S&T profiler opens an extraneous graphic to the right of the actual utility. Ignore it; it's present only when opened from a direct link. When opening it from appropriate page at S&T, the extraneous graphic is absent, but you need to log-in to access it from the S&T page, but no log-in for the direct link above. BTW, this Mars Mapper works fine in both my Win 7 laptop and my iPhone 5s. See the difference between the "Sky and Telescope" Profiler and the "Astronomy Now" Mapper. Which one would you want to use to locate the NPC (North Polar Cap)? File comment: The Mapper software does a much better job of showing the NPC. The new results agree with previous models that indicate a glacial period ended about 400,000 years ago, as well as predictions about how much ice would have been accumulated at the poles since then. Curiosity's view of Mount Remarkable, in video format. This is really interesting, and I want to learn more. An intensive Google search of ~120 seconds has returned nothing so I am turning to my fellow ASTRA members. The current Mars epoch (a moment in time chosen as the origin of a particular era) began on 12/29/1873, over 50k sols ago. What the heck, astronomically or culturally speaking, happened on that day? Does anyone know? Oh nevermind. It's the birthdate of Carl Otto Lampland. He was involved with both of the Lowell Observatory solar system projects, observations of the planet Mars and the search for Planet X.
Olivier Mousis at the Marseille Observatory in France and his colleagues suggest such a storage reservoir could be composed of zeolites: sponge-like minerals with microscopic holes and channels that easily trap and release gases. Unfortunately, we still haven’t found them. There has been one potential detection from orbit, but it hasn’t been confirmed. And despite searching for them on the ground, Curiosity has yet to find evidence for zeolites in Gale Crater. A little history from my friend Dr. Beachcombing. Lowell was well aware of the mistranslation (of channel to canal), but he nevertheless deduced, to his own satisfaction, that the canals had been built. They had been built, he decided, by a dying civilisation on Mars that wanted to drain water from the icy poles towards the equator in harvest season. What astronomers were seeing, argued Lowell, were not lines in the deserts but blooming vegetation around those lines as water filled the channels. From the canals Lowell built a whole series of secondary theories including the position of Martian settlements and even speculation about how long it would take a Martian to build the channels in question. Lowell would then – in his talks and his writings – leave science behind and end with a dirge about how Martian life was dying as water was leaving the red planet and how this fate awaited the earth too. There was something very fin d’siècle about Lowell’s Mars. By the way, Lowell's books on Mars are available in your preferred ebook format at the Internet Archive! Knowing what season it is on each of Mars' hemispheres is important in understanding the changes in its visible features. Then, go to the first chart that appears in http://www.nakedeyeplanets.com/mars-seasons.htm. In it, Ls is referred to as the "Areocentric longitude".